A drill press packs lots of capabilities into a small footprint in our space-challenged shops. The JET 15" Variable Speed Floor Model Drill Press takes that concept a few steps further. The JET 15" Variable Speed Floor Model Drill Press appears to have been priced for the DIY consumer market but designed to provide the accuracy, versatility and durability to keep up with a busy shop environment. Everywhere you look on the JET 15" Variable Speed Floor Model Drill Press we find opportunities to use cheaper materials that JET did not take. There is lots of cast iron, high end steel and quality components where lesser machines use plastic and other “cost-saving” materials and workmanship. If anything the JET 15" Variable Speed Floor Model Drill Press is overbuilt but promises a long, long service life that extends your tool-buying dollars. The JET 15" Variable Speed Floor Model Drill Press weighs in at 426-lbs. and you can see nearly every pound of that bulk in the large iron base, a heavy-walled 3”-diameter steel column and the massive cast iron power head that provides a solid base for all of the components. The JET 15" Variable Speed Floor Model Drill Press is 30”-deep by 20”-wide and 71”-tall. The cast iron base is 20-7/16”-deep and 14-3/16”-wide. It has a “work table” built in that is 12-1/8”-deep by 11-13/16”-wide and has a pair of ½” t-slots. 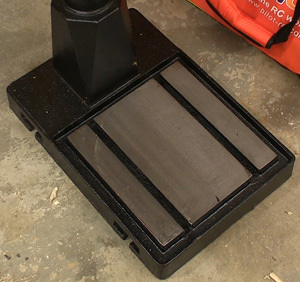 The base also has holes for securing the JET 15" Variable Speed Floor Model Drill Press to a suitable floor surface. This drill press can hit the center of a 15”-diameter work piece with its 7-1/2” spindle center to post dimension. JET lists drilling capacities of 5/8” in cast iron and ½” in mild steel. For the vast majority of users that range covers everything that they could reasonably anticipate encountering. 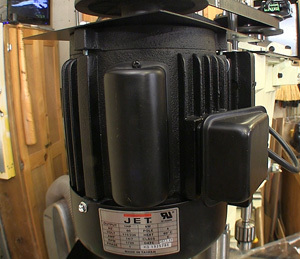 JET's 1 Hp motor (left) looks huge because of the cast iron case that controls heat and offers long-term support. This is not a cheap motor. 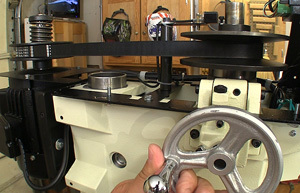 the variable speed system (right) uses variable pulleys for smooth, infinite RPM settings. The super rigid 2-1/4”-diameter quill sports full bearing support to guarantee precision drilling now and in the future. A ½” keyed chuck (with arbor) is included to make full use of the massive 6” quill stroke for ultra-deep hole capabilities. An easy-to-use but very accurate depth stop lets you be dead on precise with the depth of one hole or hundreds. 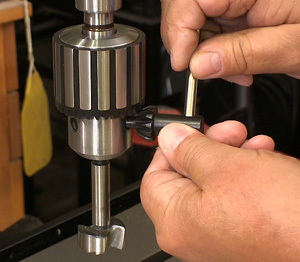 The spindle has the very common #2 taper that opens the door for using many accessories on the market. 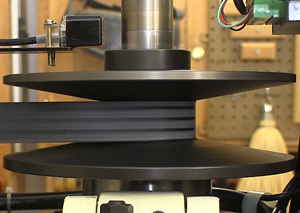 Spindle to base clearance is 44-1/2” while the maximum spindle to table dimension is 25-3/4”. The JET 15" Variable Speed Floor Model Drill Press is powered by a stout 1 HP, 115/230V, 1Ph motor with a cast iron base and generates a wide RPM range of 400 to 5,000 RPM. You can hit any speed within that range with a crank on the side of the power head, (operated with the machine running) and reading the digital display on the front panel. I noticed that the RPM is read directly from the spindle shaft rather than using a computer chip that computes speed based on electrical flow. Reading the actual shaft speed is far more accurate. The generous work table measures 15”-deep by 18”-wide and has a vertical travel range of 16-3/4”. The table has a pair of ½” t-slots set 5-5/16” apart on center. JET rates this table with a 90-lbs. weight capacity. The table has a “valley” around the outside edge that helps contain debris to make cleanup easier. For the home user this also reduces the chances of tracking metal chips into places you spouse will not appreciate. 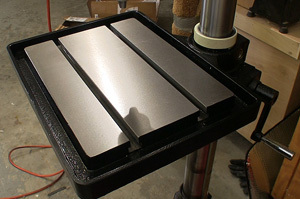 Machines like the JET 15" Variable Speed Floor Model Drill Press benefit from mass when it is applied properly. In this case the JET engineers had no fear of adding material where it would make this machine more durable, smoother running or enhance accuracy. The JET 15" Variable Speed Floor Model Drill Press reads true shaft speed (left) so the LCD RPM screen is dead on accurate, not an electronic guess. The keyed chuck (right) is tough and grips bits securely. The remarkable 6” stroke available at the quill is controlled by a three-spoked wheel that makes applying pressure when needed easy. The diameter affords the operator plenty of leverage to make boring large holes less of a test of strength. Since many drilling jobs can involve large numbers of holes this is an important feature. The work table is very solid yet can be moved up and down with ease using the hand crank. The friction position lock works easily yet holds the table firmly so there is no deflection that could compromise accuracy. A pair of oversized cast iron webs beneath the table insures that stability. The simple but very solid depth stop mechanism lets you quickly set a solid limit for hole depth that does not wander during use. This is a crucial feature for multiple hole jobs and JET did not get tricky here. They used a well-made, proven system that is very quick to set and adjust. I know that the keyed chuck will concern some users but it functions very well and makes gripping large diameter drills securely an easy task. The #2 Morse taper in the quill means that if you really can’t survive without a keyless chuck finding one that fits the JET 15" Variable Speed Floor Model Drill Press is not a problem. 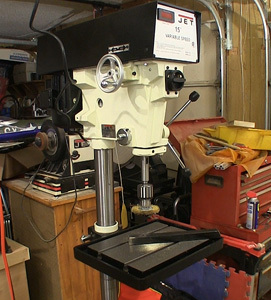 The JET 15" Variable Speed Floor Model Drill Press does everything I need in a drill press. Just as importantly it does not do any of the things I don’t want like vibrate or come up short on power. The variable speed pulley system lets the 1-Hp motor deliver all the power that you need at the drill bit. If you have problems making holes with the JET 15" Variable Speed Floor Model Drill Press, sharpen the bit! This machine does not lack power for any sane operation. The work table (left) and the base table (right) have t-slots to secure work, lots of flat surface and the base offers holes for securing this machine to a suitable floor. Variable speed is an important feature of a drill press but you will need to download one of the many drill speed charts on the Internet to make full use of this capability. JET includes a SFM (surface feet per minute) chart in the manual that references the speed of the outer edge of a drill bit. If you are a math whiz they include the formula for converting the SFM speeds to RPM but the rest of us need to keep a simple speed chart near our drill press. The JET 15" Variable Speed Floor Model Drill Press showed no deficiencies or bad habits throughout the evaluation period. It is smooth (and quiet) running, has plenty of power and is dead-on accurate if you secure the piece being drilled correctly. The controls are simple and the variable speed system controls one of the wider speed ranges I have seen in this class of machine. The JET 15" Variable Speed Floor Model Drill Press has a street price hovering around $1999.00 (6-23-2014) which is not bad at all for a beefy, versatile drill press for the home or average shop. It has the capacities we need and the durability we look for to make buying it a long term investment. If you need a solid, capable floor model drill press you need to check out the JET 15" Variable Speed Floor Model Drill Press – first would be a smart move. JET J-A5816, 15" Variable Speed Floor Model Drill Press product page - Click Here. Have a comment on his review? –Email Me!